We are so excited as this time we are CASEing the very talented Kim. I have follwed Kim for a long time now and I am always inspired by her ceeativity. Check out her blog Cupcakes, Cards and Kim. You will be amazed by her style I can assure you. I was so pleased when Kim agreed to join us and be our CASE designer for this challenge. And even happier that she gave us a Birthday card rather than an Christmas card to CASE! Our Guest Designer for this challenge is the very talented Deepti. I am sure many of you know Deepti but for those of who don't take a look at her amazing blog here. Have a browse around and I guarantee you will be inspired. Deepti has certainly inspired me for many years now. Deepti and our DT have all CASEed Kim's card in their own special way. Take a look here and then take some TIME OUT and craft with us. 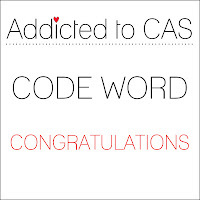 Addicted to CAS-Congratulations-4 year Birthday! 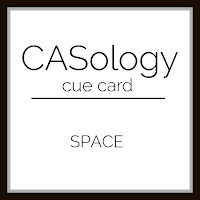 CASology-Space-my balloons are off there! Plus lots of yummy white space! Beautiful CAS card Sandie..For me , It's so difficult to make one layer card with so much of white space...You Rock dear!! Sandie...your card is so beautiful. Love the soft sweet colors of your balloons. So pretty. Thank you again for all your kind and sweet words, they mean so much to me. I can't wait to make my reminder card. Love the bright colors...and your balloons are perfect. Heading off to pick up Ryan from college this morning...First semester is complete! Love your bright and happy balloons, and how they are going off the page. Thanks so much for playing along at CASology. 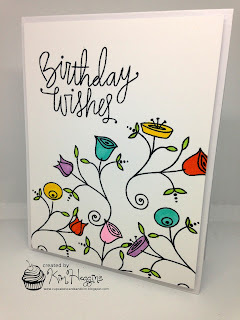 I love your take on Deepti's card! 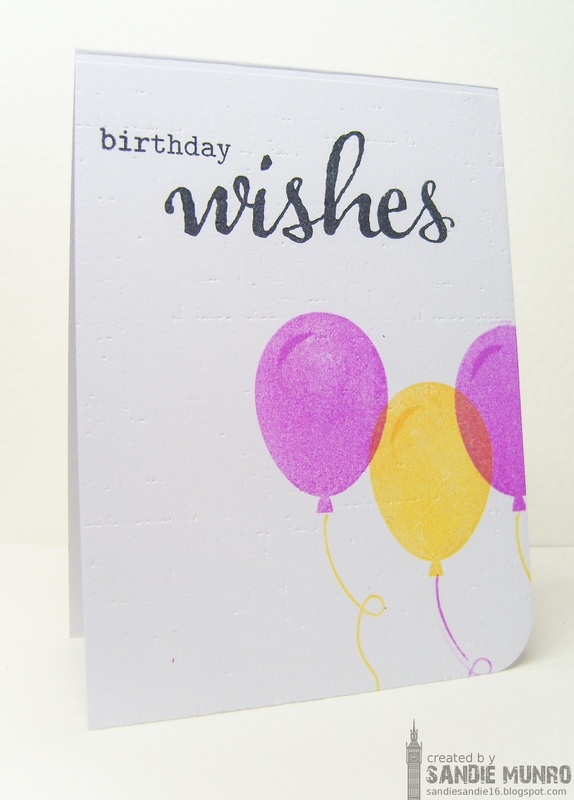 Love the purple and yellow combo and the translucency of the balloons! Another beautiful card Sandie! I love how you coordinated the colours of the strings with the opposite colour of the balloon - it is those little details that you add into your designs that make your CAS designs so wonderful! A one layer beauty, Sandie! I love how you stamped those pretty translucent balloons off the edge of the page in that beautiful colour combo too! So glad you could join us at CASology this week! Love the translucency of your balloons - so light & airy! Thanks for playing along with us at CASology this week!